COD Gayong Class 2009, Dec.
First day of Class for COD Spring Semester 2010 is Saturday, January 16th. 8am-10am class. Register now for classes so our class won't get cancelled. Malay Silat I and II are available. If you've taken our class before register for Silat II, if you are new or Silat II is full register for Malay Silat I. Also!! Dues for the United States Gayong Federation Club are due January 1st and are good through December 31st 2010. YOU DON'T HAVE TO BE A STUDENT IN THE CLASS TO BE A CLUB MEMBER! Dues are $50 for the year. Please bring dues to first day of class or contact me for a mailing address. Saturday is the last class of the '09 Fall Semester. We are trying to get space for the break. Hopefully they will let me know by next week. Breakfast after class to celebrate a successful semester, the holidays and new year's. See you all there! 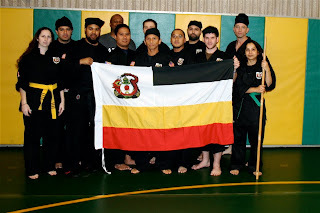 We have a United States Gayong Federation Group on Silat.tv! We will help spread gayong and the happenings of USGF on this social networking site! We are officially a club at College of Dupage! 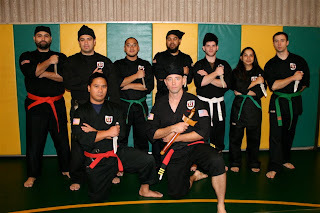 You can be a member of the USGF club without being a student of the Silat class. This club affords us many benefits at COD and beyond. More details to come! Happy Thanksgiving from all of us at USGF! Thinking about some of the Cikgu we have trained with and met in Malaysia over the years. Cikgu Kahar Redza comes to mind. We were fortunate to train with Cikgu Kahar and learn from him. Cikgu Kahar reminds me of my uncle, he's always putzing in the garden or walking around and checking everything out, but he always is watching you. He is watching your progress, making sure you are staying out of trouble, and laughing at you as you attempt new things. He at first had few words for us, the students. We got messages through other people. He would occasionally give us a nod if we got something right, but we didn't interact with him at first. When we finally trained with him, I was intimidated, I admit. We definately have language barriers, but we got the message. 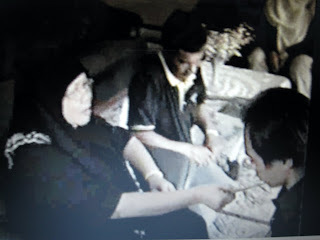 Daniel in particular can attest to Cikgu Kahar's strength in his hands, as Daniel really got the brunt of the beatings. When we did something wrong, he'd waive his hand and utter "agh!" When we finally got it right, we'd get the nod maybe with an affirmative "ah." I don't know if Cikgu Kahar's hands are strong and because of this he does Urut, or he does Urut and that's why his hands are strong. Cikgu Kahar helped me with my shoulder pain by performing Urut massage techniques on my feet and hands. If I could have crawled out of my skin, I would have. If you've ever gotten a deep tissue massage, and the tech finds a knot and really tries to get the knot out you begin to understand Urut pain. When you twitch because a spot on your foot or hand is painful, he will stay at that same point until he feels he can move on. Each spot means something else, but when he found the spot and told you what ailment it coencided with, you understood why it hurt. My feet were pretty numb when he finished, and he told me they would be itchy in a few minutes, as the blood flow returned. It was painful but relaxing afterwards, as my shoulder finally relxed after the long plane trip and carrying camera equiptment, luggage, and gifts around. Cikgu Kahar has that thousand yard stare that will intimidate you when you first meet him. He will beat the tar out of you and jump around you until you are dizzy. If you pay attention, you can learn a lot, even if you don't train with him and just get to be around him. This saying makes me think about my own teachers in Silat Seni Gayong. I was taught first by Gene Scott, a senior student of Cikgu Sam, then taught by Joel Champ and finally Cikgu Sam took me as a student. At each point in training, someone new "appeared" to continue my journey. From my teachers in the United States, I have been able to learn from Cikgu Jaz, Cikgu Malik, Cikgu Kahar and many other Cikgu in Malaysia. Some of the teaching is not crossing hands but talking and explaining. This is also training. Sometimes I ask questions that I am not ready to know the answers yet. Sometimes I am. Sometimes I get asked questions that students aren't ready to know the answers to. All you can do is trust yourself and trust your Cikgus. Train hard and the teachers will appear, just don't forget to look for them! Here are two other blogs of note. One is Cikgu Jazwan Kahar's blog from Malaysia and the other is Cikgu Shaiful Hakim's blog from France. Both have lots of information on Gayong in English. They are reputable speakers for Gayong! I recommend you become of follower of their respective blogs so you'll be updated when new posts are published. Hey while you're at it, follow our blog too! Cikgu Jazwan Kahar in August of 2005 was appointed the instructor in Malaysia for all international students by the late Cikgu Siti Kalsom. I was there, I witnessed it and have it on film. Why did she give Cikgu Jazwan this task? In my opinion Cikgu Jazwan was the right candidate. He traveled to the United Kingdom to teach Gayong Students there brought by Cikgu Ariffin, he taught U.K. students in Malaysia, and he taught Gayong Students from the USA in 2005, 2007, and 2009. He personally taught me on several occasions. Cikgu Jazwan has a broad view of Gayong and understands the differences in teaching Malay students and international students. He will adjust he instruction for student keeping true to Gayong but helping the students understand the techniques. I am not Malaysian, I am American. There are things in Gayong that as an American, I don't culturally understand. Cikgu Jazwan will explain not just how to do the technique, but the "why" of the technique. For an international student whose inane culture is not Malaysia, his ability to be patient with our training and our questions is essential to our understanding of Gayong as a whole. Cikgu Jazwan's broad world view and experience with foreign students makes him the ideal candidate for Cikgu for international students coming to Malaysia to train in Gayong. He is faithful to Silat Seni Gayong and it's traditions and incorporates those into his training of foreign students. We have filled out the necessary paperwork to form a Club at COD. This will allow us to have extra events/training ourside of regular class time. We will find out if we are approved in the next two weeks! What do we bring to Gayong? What do we, the international community, bring to Gayong? What do we, the international community, receive from Gayong? These are questions I struggle to find answers to as I continue to train in Gayong. I try to know what I bring to Gayong, strengths, weaknesses, perspective, etc. The struggle with being an non-Malay training in Gayong is our identity. We are Gayong. But we also have other labels that go along with "Gayong." There are a handful of teachers who have taught Gayong in another country other than Malaysia. They are the Cikgu with unique perspectives. They are Malaysian, they live in a different culture and then have to translate "Gayong" to these foreign students. The way they would do things in Malaysia may not apply to the new country and culture. I don't begin to understand that struggle. Those of us who are Gayong instructors who are not Malaysian face an even bigger issue. How do we learn to adapt "Gayong" as we have been taught by our Malaysian Cikgu, to ourselves and find our Haqq? How do we find balance in teaching? I am bound by my experiences, my culture, I have to understand Gayong and Malay Culture, and try and translate that to my American students who are starting in Gayong and don't know Malay Culture. Those of us taught by Cikgu Sam and Cikgu Shamsul talk among ourselves on how do we successfully accomplish the task of teaching a Malaysian Art to American students. Malaysians inherently know Malay culture. Your culture is engrained in you as a child and you just "know" things. When I have traveled to Malaysia, I have to ask questions about why this and why that. Sometimes I get a puzzled look, but the questions of culture, Adat, and Adab are answered and I try and adhere as best I can. When I go home, I have to remember these little things to make sure the students here understand the intricacies of Gayong as they arise. Taman Nirwana Wedding Demo in Malaysia! SELAMAT HARI RAYA from USGF! It's the day after I saw the Fight Masters: Silat show. It's still a bit surreal. I mean Cikgu Sam, Joel, Cikgu Shamsul, Cikgu Jaz, Cikgu Kakar, Pak Pow, Cikgu Rasol, Cikgu Hamza, Cikgu Malik, Cikgu Azman, Cikgu Anuar, the other Cikgu there for Mandi Minyak and the unaired Sundang portion, my Friends the Taman Nirwana boys (Jaz, Alang, Kairur, Man, etc), Pak Pow's students, Kak Nor, Lisa, everyone are people I know! They are all involved with the show and most are in the show! Pretty cool. There were three things that I got to see that didn't make the show that as a Gayong student, I really wish they had made the cut, but as a viewer I understand time contraints. I really wish the Sundang portion had made the cut! I really with the bottle breaking made the cut (though a student at the shoot posted it on youtube from his cameraphone)! I wish Cikgu Anuar's commentary made the shoot! My knowledge of Malay mostly consists of numbers, words from techniques (which really don't help with general conversation "deadly support" doesn't typically come up,) and food. I was looking forward to Cikgu Anuar's commentary with English subtitles. I wish more Cikgu could have been there. I'm not trying to be greedy (ok a little) but I had such a great time meeting and seeing all the older Cikgu interact with more it could only have been better and more wonderful! Getting to meet and interact with different Gayong teachers over the many trips to Malaysia is one of the best parts about traveling to Malaysia. They are the knowledge holders, they are the ones to lead Gayong into the future. Fight Masters: Silat- A Completely Biased Review!! The show starts out with a great shot of Cikgu Jazwan. His movements illustrate the precision of Gayong striking. The empty hand techniques, Sanga Maut (a locking technique) and Seligi (nerve striking) illustrate the varied movements in Gayong. The techniques are varied and encompass different things for different outcomes. The locking is for breaking bones, while the Seligi moves are for nerve damage and "softer" tissue damage. The selection of these two varied techniques gives the viewer a good glimpse at the variety in Silat. Next they moved on to weapons. Though many were filmed, the ones that made the cut were kerambit, keris, and cindai. The kerambit showed more of the "sneaky" aspect of Gayong. This weapon is hidden and deadly. It shows that you should never underestimate your opponent, because you never know. The keris is great to see! It is the weapon of Malaysia. It has a rich heritage steeped in Malay tradition. This segment in particular showed that a "common" weapon of great heritage has a deadly purpose. It is used to inflict maximum damage. The cindai is a flexible weapon, here shown using a sarong. 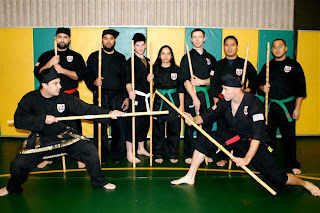 These techniques illustrate how Gayong grew from using everyday items that people had near then, into a Martial Art used for protection. The cindai is again, a sneaky weapon that makes you re-think the people and items around you. The Mandi Minyak ceremony was truly inspiring! All the teachers that were able to be there and participate, even those not on film made the experience unforgettable. This program shows the boiling oil, it gets you close enough to hear the boiling oil bubble break the liquid's surface. The sound, the heat, the smells are all part of your test of faith. Can you really do this? Can you take perfectly good and useful hands and really dip them into this angry looking liquid? Fight Masters takes you on the journey with Joel, you feel his nerves kick in at the moment of truth. The final part was showing Silat Olahraga. One thing I wish had been explained better was the fact that Silat Olahraga is a totally separate art. It is not part of Silat Seni Gayong. Olahraga is a sport version of Silat. Like Tae Kwan Do and Karate, Silat as a whole has moved into sport fighting with rules and boundaries. In this new and different art Joel had to fight a SEA Games Champion. Joel trained for a few hours over the course of a couple days and then was put in the ring. Joel took a beating and held his own. This is where the story becomes full circle about Joel's journey. Joel's heart, his determination is what pulls him through this fight. Even though Joel loses this particular battle overall he wins the war. 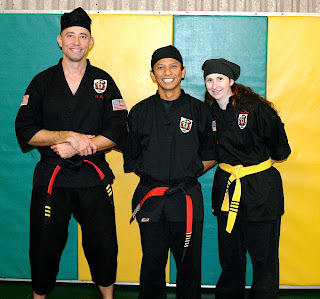 He is successful and at the end is awarded his third degree black belt. Cikgu Sam's and Joel's own words at the end of the program show you how much Silat Seni Gayong means. Gayong becomes part of you, it isn't just a "hobby" to either man. This show overall made me very proud. I don't use the word "proud" lightly or in a condescending manner. I say it made me proud because everyone involved, the Gayong teachers, students, crew etc. all worked hard to bring you an authentic look as possible into the world of Silat Seni Gayong. Silat Seni Gayong can be a devastating art. It takes years of training and proving yourself to attain the rank of black belt. It usually takes between 8-10 years of consistent training to reach that level. For a Western brain thinking of "Karte Kid," typically when a Gayong person attains a Red belt level they will start teaching and this level is fairly equivalent to a black belt in most other arts. That having been said, Joel's training to receive his third degree black belt did not all get accomplished over the course of shooting this show. His training to get to third degree had been ongoing for years prior, this show was the catalyst for his getting additional rank. Those that know Gayong, know that this rank is not given out on a whim, it is earned through blood, sweat and tears. Joel has paid his dues over the years and earned his rank the old-fashioned way, it just so happened that this final aspect of his promotion was captured on High Def with a camera in his face shooting a show. but I hope the general consensus is that this is a positive thing for Gayong. I feel that it is. Joel asked my to clarify a couple of things. With the upcoming Silat show, he has done some interviews and some information may have gotten a little lost in translation! Joel Champ is currently a Master-at-Arms in the United States Navy. He does military police work for the Navy. Joel is currently ranked 3rd degree Black Belt in Silat Seni Gayong. Joel is the highest ranking student of Gayong in the United States. Joel has trained in Silat Seni Gayong under Cikgu Sheikh Shamsuddin (Sam) for over 13 years. He has traveled to Malaysia and trained with many Cikgu there. He was adopted by Cikgu Siti Kalsom in 2005 as her son. Joel has written many articles on Silat for Seni Beladiri Magazine and Black Belt Magazine, and has given many seminars on Silat with Cikgu Sam and USGF. 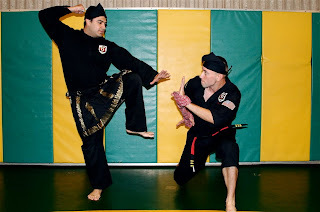 Another article on Fight Masters: Silat. Below is a link to an interview with Justin, the producer and Lamb, the cameraman about the documentary on Silat with Joel Champ. 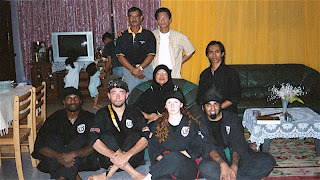 Today the Fight Masters: Silat promo for Malaysia was posted on facebook and on this blog. When I saw it, I was really proud. I am proud of all those people who participated. There are many people in Malaysia in the Gayong community who came out in support of this show. The teachers and students that came out for Mandi Minyak was incredible! The students who drove from Johor for hours to say hello and meet us and support their teacher Cikgu Jaz and the rest of us, the students from Taman Nirwana that stayed at the jungle campground for days to be there early for shooting, the students who traveled with their teachers to come and support and lend their bodies to the abuse of Silat for the good of the shot. All these people, many of whom didn't make the final cut of the show made that Nat Geo show what it is. Their participation made the long journey, lack of sleep and injuries all worth while. Every time I go to Malaysia, I am amazed how wonderful and generous everyone is. We are one little corner of the world, in a surburb of Chicago, playing Gayong. We go to Malaysia because we want to, we like training there, we love the Gayong people we meet there. They take us in as family, deal with our questions and clambering around. I'm not usually a sappy person, ask the USGF group, they will attest to this. Having said that, as this show "Fight Masters" airs and proceeds, gets good reviews, etc. I am constantly reminded of the experience of being a bystander on the shoot and how everyone involved, main characters, extras, punching bags, cikgus, crew, production people, etc. brought this show to life. It was blood, sweat and tears that made this happen and the result speaks for itself. Just watching the 20 second preview made me reflect on what a truly unique and special experience this was. This is the promo for Fight Masters: Silat scheduled to air in SE Asian in the next few weeks. It will air in Malaysia on 31 August (Merdeka Day.) I think the promo looks amazing! Class at College of Dupage starts this saturday at 8am! If you are new to COD classes, please wear comfortable clothing, a shirt with sleeves (can be short sleeved just please no sleeveless), long pants (it'll save your knees from the mat) and if you opt for shoes, they need to be inside shoes only, no street shoes. You don't need to buy a uniform right away, try class first and if you choose to be ranked in our art then you'll need a uniform. You must sign up for COD to take classes. You may try a class before signing up, but you must sign up to train as you have to be covered under COD insurance as a student of the class. If you'd like to bring a friend ever to try class, they are more than welcome to attend a class and see if they like it. See you all bright and early on Saturday! Fight Masters: Silat - will air on 31 August (Merdeka Day) in Malaysia! This show was filmed in HD over the course of 10 days. Will feature Joel Champ as the main character to is brought to Malaysia by his Cikgu, Cikgu Sam to continue his training in Silat Seni Gayong. This is an incredible glimpse in Silat Seni Gayong! I was fortunate to have traveled to Malaysia to observe the shoot. I can tell you from first hand witness, this is set to be very informative and very insightful. Joel is taught by Cikgu Jazwan Kahar, Cikgu Kahar Redza, Cikgu Kamal, Cikgu Malik and many other of Silat Seni Gayong's Silat masters in Malaysia. Joel has trained in Silat Seni Gayong for over 14 years. His journey on this TV show is incredible. The filming schedule was intense, they filmed everyday even on the one "day off." Joel was asked to do many things he has never done before, including sport fighting a SEA champion (South East Asia Games), and more traditional training and tests of faith. It will air in other regions of the world after the Malaysia airdate. I'll keep you posted on the other airdates when they are made known. Bravo Joel!! Classes start the end of August at COD. Classes will be held 8-10 am Saturdays. There are two classes- Malay Silat I and Malay Silat II. If you have never signed up before, sign up for Silat I and we'll move you around depending on Skill level. If Silat II fills up, just sign up for Silat I, we know where you belong and will move you around as needed. Hopefully the Silat Club will be up and running by the time fall semester starts. We'll fill you in more as information from COD becomes available. We are currently in the process of updating the website. It should be updated by the end of the month. If you'd like your website linked to ours, please let me know!